The chalets are the ideal choice for those looking for privacy, comfort, land and space to enjoy all the features offered by this type of houses. The town of Denia offers a multitude of options to those who are considering purchasing a chalet or villa, either as a first or second home. Villa with seaviews for sale in Denia. 130 m² built, fenced plot of 306 m² with space for the construction of a swimming pool and double carport. One single storey with and a small storage room in the basement. One of the covered terrace is glazed, hallway, livingdining room with open kitchen, two bedrooms and a bathroom. The property is in need of improvements but is certainly a good deal. Currently there is a water supply but no electricity. Chalet for sale in Denia beach.If you were looking to buy a villa on the beach of Denia, where the same can live all year who use it for vacation, if you do not want to make a very high investment, but you don't want reform, Lluna Denia offers you this small village one step away from the sea without having to cross road, semi new, recent and ready for construction. Duplex, with more or less 300 m² with barbecue plot and storage room, various terraces and space to Park 2 cars. On the main floor has living room separated in two spaces and open plan kitchen, bathroom and bedroom and on the first floor, 2 bedrooms, terrace and laundry room with possibility of turning into a second bathroom.View clear, sunny, well oriented and easy to maintain. The House of your dreams. Cozy villa in a quiet complex, ideal for permanent living or for vacation. The property is located 700 metres from the sea and 1.2 km from the centre of Denia. Within walking distance of the municipal sports centre and tennis courts of Denia, supermarket Aldi, hairdresser, shops, and restaurants. The house of 98 m² is located on a plot of 220 m², with swimming pool, Garden, barbecue area and an independent storage. The main floor has: 2 bedrooms (with double beds), one with access to the pool, a spacious lounge with fireplace, where it also has access to the pool and barbecue area, a kitchenette, a bathroom and a toilet. On the first floor: 1 bedroom or office. The House has been refurbished in 2011 as well as all the appliances. Extras: air conditioning (hot and cold), heating, bars on the windows, washer and dryer, the pump and the filter of the swimming pool are in an independent.storage room The villa is for sale with all the furniture and appliances, and do not need additional investment, you can stay there immediately after purchasing! This renovated house has its own private plot and is situated on the foot of the Montgo in a complex with pool. This Villa is built on two levels and is distributed as follows: Main entrance via the glazed terrace into the dining and living room. There is a fireplace ideal for heating in the winter months. The kitchen is open facing the dining area. There is a gas heater and air conditioning warm/cold. One of the two bedrooms is on this floor and has a built in wardrobe. There is a refurbished bathroom with a shower and a storage room as well. Upper floor: via internal stairs you reach the upper floor consisting of a bedroom with a built in wardrobe and a separate bathroom with shower ensuite. There is access to the outside covered terrace which has fantastic sea views and is ideal for having breakfast and enjoying the views. The villa is in an overall very well maintained condition and has double glazing, mosquito nets, an additional storage and washing room, a private easily maintained plot with palms, shrubs and fruit trees. The communal pool is aprox. 50 m away and Denia at 3 km. The sea is aprox 1 km away. An ideal property to live in the whole year round or as a holiday home to enjoy your time off. Villa duplex of 107 m² with its own plot. Close to the town centre and at the foot of the moutain Montgó. On the ground floor there is a bright living room with fireplace and air conditioning, a large fully equipped kitchen, bathroom with shower, covered terrace, pergola, garden and parking. On the first floor are the two double bedrooms and a bathroom, enclosed terrace with Climalit and PVC. It has heating by radiant floor. n perfect condition, located in an excellent, and quiet area near the town centre (1.1 Km) and all the services. Fully gated community with only 18 neighbours and with swimming pool. Ideal for year round living or to enjoy your vacation in a privileged environment. Ready to move in. House for sale near the beach of Les Deveses Denia, of rustic style, built by probably one of the best builders in the area.On a plot of approximately 400 m², this house of 125 m² built has on the ground floor s lounge, dining room, open plan kitchen, 2 bedrooms, 1 bathroom and a covered terrace. On the first floor there is a large bedroom with dressing room and en suite, a terrace and solarium.Equipped with air conditioning, heating of marble and fireplace, large storage room, parking.An ideal dwelling for the holiday or to live yearround, sunny, this property is in very good condition and must be seen !!! Villa situated only 2 minutes from the most beautiful sandy beach in Denia, Les Deveses. This private villa was built in the year 2000 on a plot measuring 400 m². The house has 100 m² of habitable area consisting of the following: Entrance via the glazed terrace into the living room, separate spacious kitchen with a dining table, three bedrooms and two bathrooms, one with a bath tub and one with a shower. The master bedroom has built in wardrobes and the bathroom with the bath tub ensuite. The villa has electrical heating, air conditioning warm/cold, double glazing and mosquito nets. In addition, there is an outside small house measuring 33 m² with two separate entrances. One side it the sauna and gym room and the other is the washing room, toilet and workplace. There is an oustide covered parking space, an easily maintained mediterranean garden with a diverse selection of fruit trees and there is a barbecue with an open sitting area in between the large fig tree and the palm trees. The large 12x8 m communal swimming pool and shower are only 30m away. There are a total of only 15 neighbouring houses. There is a bus stop 100 m away, shoping facilities are 3 minutes away by car and various restaurants can be found nearby. This villa was built in 2001 on a 1.175m² plot in Monte Pego. Wonderful views of the surrounding area, to the sea and mountains. This property has an easy and direct access from the carport leading via a private and idyllic terrace to the entrance of the property. The villa has two bedrooms and a bathroom with a bath tub, a living room with a fire place and seaviews, an entrance hall, a closed kitchen with all necessary appliances and a glazed naya with direct exit to the outside terrace. Downstairs there is a separate apartment with two bedrooms, living and dining area with a kitchen and a bathroom with a shower. Throughout the villa there is underfloor heating, double glazing and moskito screens, various sitting areas such a covered pergola behind the house, an outside shower and possibility to build a swimming pool, carport, washing room and storage. The property is for sale furnished. 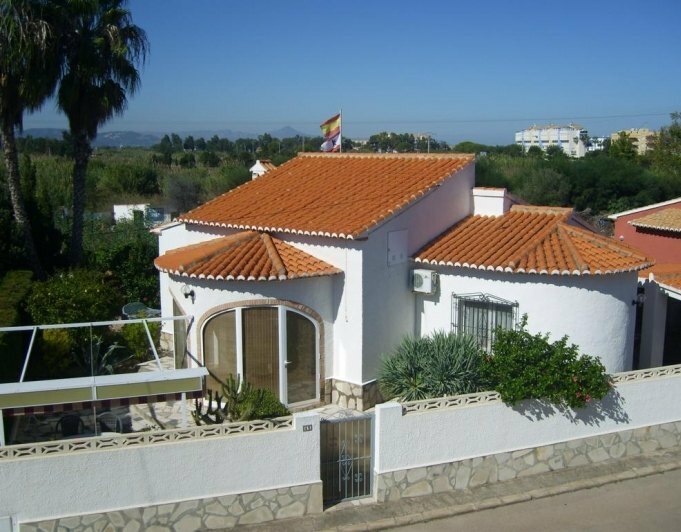 Villa in a very quiet area on Denia Las Marinas. This Villa was built in 1996 but has been completely refurbished and supplied with many extras. The Villa was built on a 354 m² flat plot and is situated in a dead end road only 1km from Denia and 500m from the beach near Parque Bassetes. There are two bedrooms with built in wardrobes, one bathroom with a shower, closed kitchen, dining and living room with a fire place and a glazed naya. In addition there is electric infrared heating throughout the whole house, hot water via solar power on the roof and all windows are double glazed with fly screens. There is an outside covered parking space, a storage and washing room with an outside toilet, a large outside kitchen with covered sun blind and of course not to forget the 6x4 m swimming pool and outside shower. This property is ideal to live in the whole year round as it has sun all day and shopping and going out can be done walking. Villa for sale in DENIA. 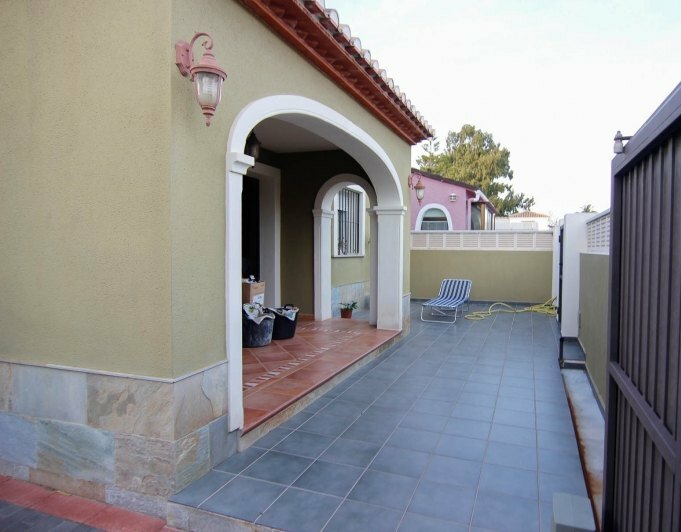 House of 120 m² built with two bedrooms and one bathroom, plot of about 650 m²with fantastic views to the sea and the city, in a quiet and residential area. The property is in very good conditions, with a tropical garden, private pool and parking, large court yard, gas central heating, storage room and many extras. If you are looking for peace and nature this can be your ideal home! 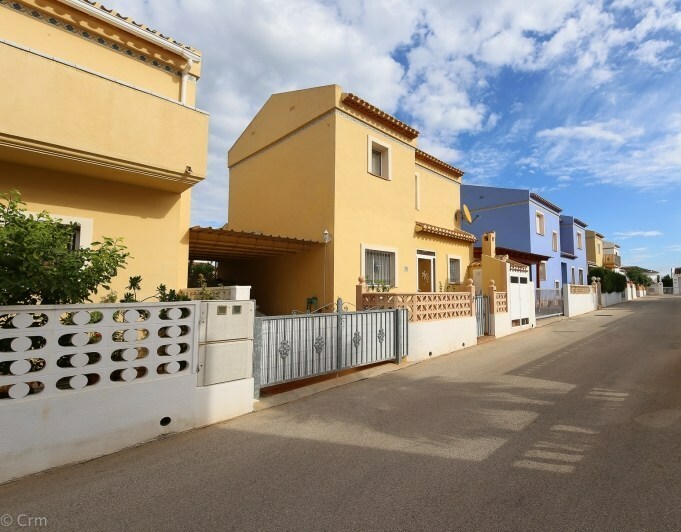 House in Denia for sale, only 2 km from town center and the beach. Tosal Gross area, Community swimming pool and garden, private garden, totally renovated house, separated guest room with bathroom, fenced plot with parking for 3 cars, The real estate market is totally recovered and prices are going up so we recommend a quick viewing. 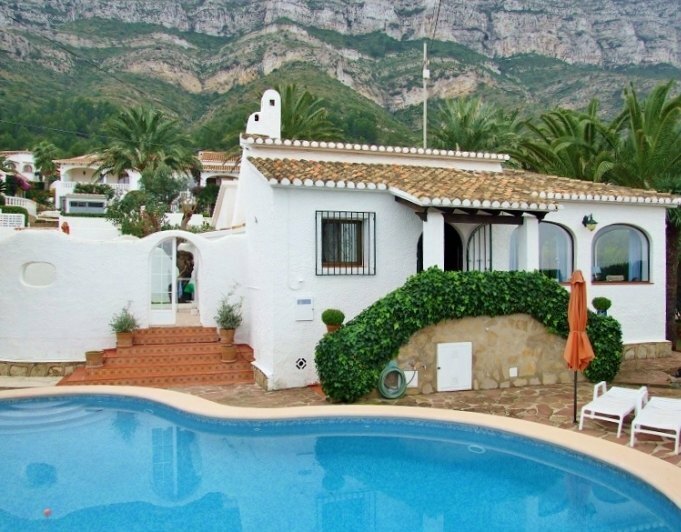 This villa is situated on Denia Montgo and was built in the 1980s. However, it has been refurbished ever since with new pvc double glazed windows, mosquito nets, gas central heating and electrical blinds. 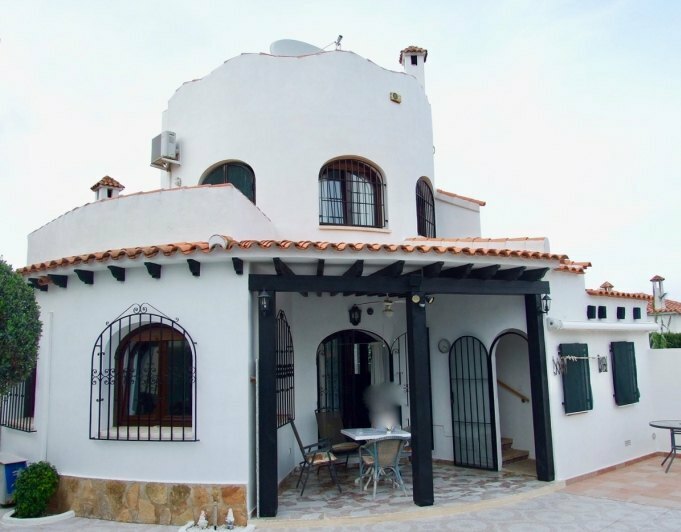 The villa has a large dining room with seaview and living room area with a fire place, an outside covered terrace and a kitchen maintained in the typical spanish stile. The kitchen has been newly tiled. There are two bedrooms with built in wardrobes and a new bathroom with a shower. Downstairs there is a separate apartment with a bathroom and a bedroom. On the outisde of the villa there are many different sitting areas where you can enjoy the view of the Montgo and garden (cactus, palmt rees, shrubs and other mediterranean vegetation). There is a large outside warm water shower with a separate storage and washing room. In addition the barbecue is ideal as a summer kitchen. There is a garage and two parking places. The pool measures 6x8m and there is a covered terrace directly by the pool. A property to enjoy all year round. 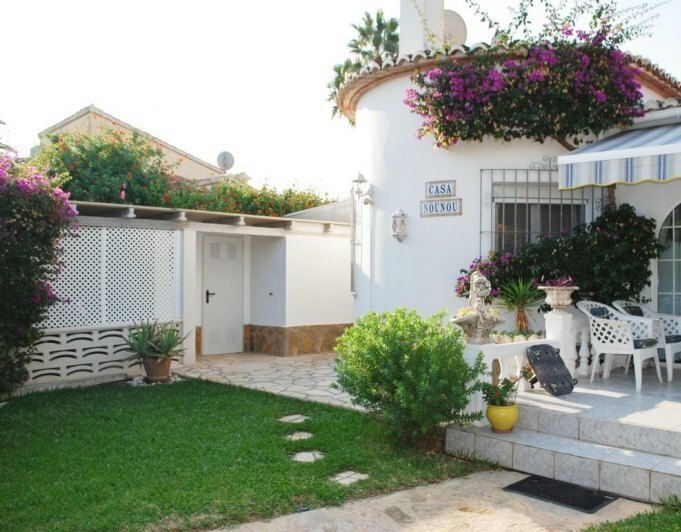 Nice and cosy chalet in plain and sunny spot close to the beach and the town of Denia. The House is located in a very quiet area with good communications. It has been refurbished in 2013. Offers garden area, large terraces, living room, kitchen, two bathrooms and two bedrooms one of them very large. It is possible to make a pool. Take this opportunity and come to visit her. 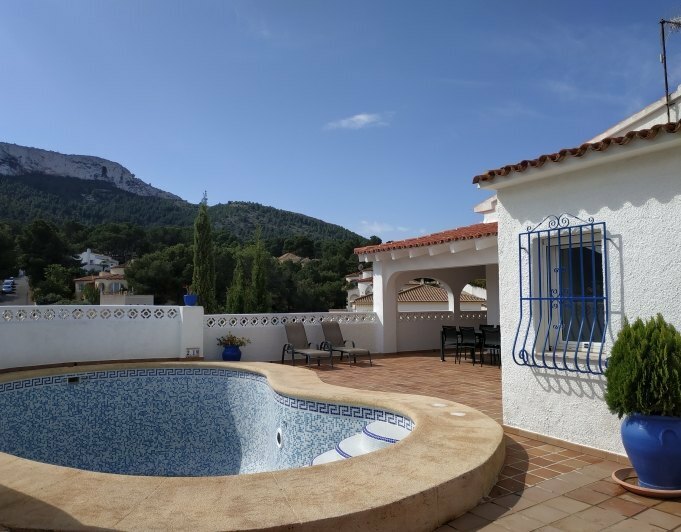 Spacious villa in Denia, with breathtaking views of the Montgo. Only 1.5 km from the city center. The house is located in a quiet and sunny area, very close to all services. It was built in 1990 and has recently been extended and renovated. The house has a total of ​​215 m² and is divided on 2 levels. On the ground floor there are 3 bedrooms, one of them has a bathroom ensuite, another bathroom, a living and dining room, a closed kitchen and a covered and glazed terrace. On the first floor is another bedroom with bathroom. The basement serves as a storage room, workshop and laundry room. The house has many extras, such as: a recently renovated 8x4 large pool, with new motor system, an outdoor shower, a safe, fitted wardrobes, wooden beams in the living and dining room, fireplace with cassette, gas central heating, 5 new air conditioning units (h / c), a gas water heater, satellite TV, and double glazed white aluminum windows with shutters and security bars. In addition, the house is equipped with an electric entrance gate and a carport for 1 car. The house is sold furnished and with electrical appliances. Do not miss this opportunity! Villa in Denia for sale. Large house with 2 floors distributed in living room, kitchen, 6 bedrooms, 2 bathrooms and 2 toilets. It also has a double garage, storage room, laundry room, 2 terraces with 50m and swimmingpool. Located in quiet residential area in the sunny low part of Montgo mountain, a few minutes from all amenities.